MONUMENTAL KOSTA VICKE LINDSTRAND GLASS VASE. Monumental glass vase by Vicke Lindstrand for Kosta. 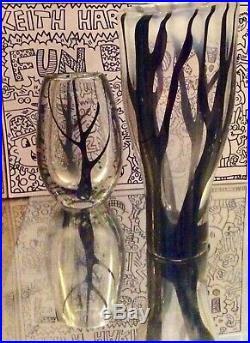 Heavy hand-formed glass, black trees cased in clear crystal, with a fog of opalescent haze in the branch tops. Vase is reminiscent of quiet, solemn woods when the fog starts drifting in on a slight breeze. Created in 1958 by Vicke Lindstrand for Kosta. This vase is part of the UNIKA series of hand made one of a kind glass pieces. Signed with acid stamp Lindstrand/Kosta and engraved LU 2005. Height 12 inches (30.5 cm) Diameter 6 inches (15.3 cm) Excellent condition. No chips or cracks, no interior staining nor cloudiness. The item "MONUMENTAL KOSTA VICKE LINDSTRAND GLASS VASE. Trees in Fog" is in sale since Wednesday, March 27, 2019. This item is in the category "Pottery & Glass\Glass\Art Glass\Scandinavian\Kosta Boda". The seller is "psdecarts" and is located in Palm Springs, California.